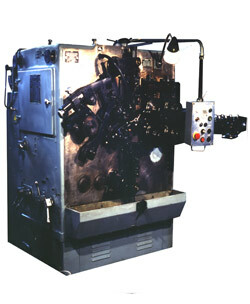 THE AUTOMATIC MACHINE FOR COLD COILING OF SPRINGS АБ5218 is designed for production of the cylindrical, conical, and barrel-shaped compression springs with tightened and not tightened end coils, with constant and variable right-hand and left-hand coiling and also of extension springs with a pitch equal to diameter of wire, without catches and straight ends, out of steel carbon spring wire of round section, rupture strength = 2500...1450 MPa. This machine can be used at any engineering branch. Wire steel carbonaceous spring a class II - IIa..
spring billet length up to 30 meters. number of cycles per minute equal up to 100.
mechanism for coiling conical and shaped springs. The machine is easily rearranged for production of springs of any type. At customer's wish the unit can be supplied with tools for production of a specific kind of spring, manufacture of small index springs, straight ends torsion spring winding device. Diameter of a winded wire, d, mm . Step of a winded spring, mm . • Productivity of automatic machines is established on diameter of a wire and number of coils of a spring. • SPRING COILING AUTOMATIC MACHINES FOR COLD TO WIND SPRINGS are delivered with a package of spare quickly worn details and with a package of the instrument for maximal diameter of a wire for manufacture of cylindrical springs. • At additional expense SPRING COILING AUTOMATIC MACHINES FOR COLD TO WIND SPRINGS is completed with the device for a unwinding of a wire.